Home Current Affairs Featured SACKED SA TO DELTA STATE GOV., FRIDAY ELURO STRIPPED OF CHIFTAINCY TITLE BY THE "OBI OF OWA" KINGDOM. SACKED SA TO DELTA STATE GOV., FRIDAY ELURO STRIPPED OF CHIFTAINCY TITLE BY THE "OBI OF OWA" KINGDOM. The SA to the Governor of Delta State, Ifeanyi Okowa who was sacked for assaulting a lady, Mr. Friday Eluro has been visited by another tragedy as gradually, everything he worked are crumbling before his feet for one mistake he took for granted. 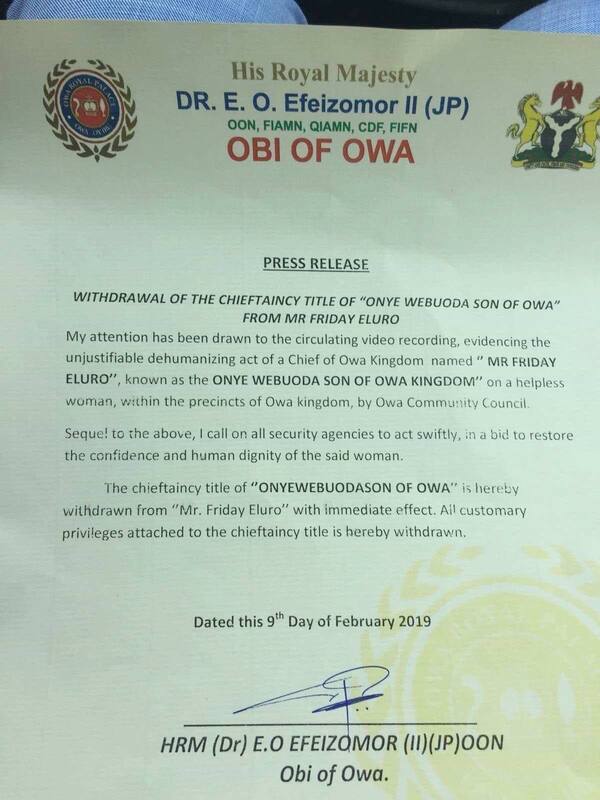 The OBI OF OWA KINGDOM, His Royal Majesty, DR. E. O. Efeizomor 11 has withdrawn the Chieftaincy title of "Onye Webuoda Son Of Owa Kingdom" from him the monster who demonstrated his total lack of respect and regard for women by acting in such a disgraceful manner to the innocent lady whom he and his gang accused of stealing a phone and thereafter, stripped her completely naked and had her videoed. 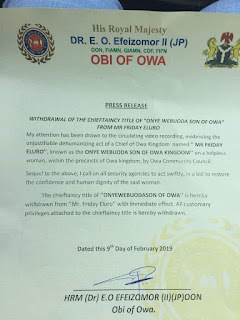 In the press released made available to us, the Obi of Owa says: "My attention has been drawn to the circulating video recording , evidencing the unjustifiable dehumanizing act of a Chief of Owa Kingdom named Mr. Friday Eluro, known as the ONYE WEBUODA SON OF OWAKINGDOM on a helpless woman within the precincts of Owa Kingdom by Owa Community Council. Sequel to the above, I call on all Security agencies to act swiftly, in a bid to restore the confidence and human dignity of the said woman. The Chieftaincy title of "ONYE WEBUODA SON OF OWA" is hereby withdrawn from "Mr. Friday Eluro" with immediate effect and all customary privileges attached to the chieftaincy title is hereby withdrawn. You would recall that a few days ago, the totally naked video of a young lady circulated on the internet, claiming that the lady stole a phone and to make her confess, the team, led by an SA to Governor Okowa of Delta State, Friday Eluro, removed her clothes completely and even inserted fresh pepper in her private part. Outraged by the act, the Governor had him removed from office and now, this. This is one of the recompense one gets for being wicked.